Car manufacturers Opel will celebrate 120 years of German engineering in 2019. To commemorate this special anniversary, Opel are launching its ‘120 Years’ special edition models. Passenger car models such as the current Corsa, the bestselling Astra, the Crossland X, the Mokka X and the Grandland X right up to the Insignia flagship will be available in the ‘120 Years’ trim, featuring a wide range state-of-the-art technologies, design and comfort features as standard. These special edition trims sit directly above the SC trim in most models and, depending on the model, includes assistance systems such as Park Assist or Cruise Control as standard. Features such as heated seats, heated steering wheel and velour floor mats increase the level of comfort. The ‘120 Years’ models become true eye catchers with stylish alloy wheels, chrome elements, door sills with Opel lettering and of course the ‘120 Years’ badge. "Opel has been democratising mobility for 120 years. In our cars, we make trendsetting technologies and features affordable for all groups of buyers. That is what we stand for! And that is why we are offering the special edition ‘120 Years’ trim level for so many of our models to mark the start of our anniversary,” said Xavier Duchemin, Managing Director Sales, Aftersales & Marketing. Order books for the Corsa, Astra and Insignia ‘120 Years’ edition models are open now, while the Crossland X, Mokka X and Grandland X order books will open in December. 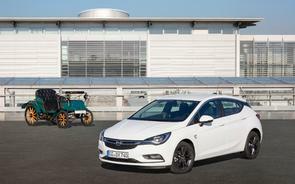 The special edition Corsa is already available from €16,650, while the 120 Years anniversary Astra starts at €23,895.